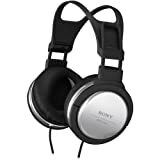 The Sony MDR-XD100 Stereo Headphones are a well-made pair of headphones that deliver quality sound at an affordable price. With 40 millimeter diameter, dome-type driver units and long-stroke diaphragms, your music will sound great. The MDR-XD100 driver units reproduce recorded sounds at a wide frequency range (12-22,000 Hz), and the headphones' ferrite magnet produces strong sounds without placing any strain on your pocketbook. With the MDR-XD100 Stereo Headphones, Sony has not scrimped on comfort. These headphones feature an ear-conscious design with soft earpads for long-time listening comfort. With these features and a pleasing design, you can listen to your favorite tunes leisurely for hours on end. Sony MDR-XD100 Stereo Headphones and unimatch plug adapter. The Sony Outlet store had this on special for $12. What a steal I thought. The headset feels comfortable but the sound quality is not very impressive. For a headset this size, you'd expect to hear some sort of BASS. I'm taking it back to the store. MDR-XD100, poor sound, great construction. With good construction this is a good buy. It's very light, but it's solid. The chord is heavy duty and extra long. The sound is sub-standard, but it can handle extreme volume. Most point to it's lack of bass, but bass is not all that the sound quality lacks. They're not good for portability, or use with portable media devices because of their long chord and a high draw of electrical current. The headphones sound their best (which is still bad) when you use them with a proper equalizer and amp (or a computer with a high-quality sound controller/card). But buying these because you have a high end sound card or expensive audio equipment is like buying a tailor with no wheels because you own a powerful truck that won't have a problem pulling it. Inexpensive. Functional. Comfortable? I don't think I agree on that one, however I say that compared some expensive high end phones I own which are very comfortable. Great headphones! I hate the buds so I wanted these... They're extremely comfortable (even on my fat head)... They even have bass! Broke and Can't Afford Headphones?